In January of 2012, we kicked off our Orion Gives Back program, selecting a local non-profit each month to be the focus of our giving initiative. And what better place to start than the Mid-South Food Bank. So, it was only fitting they were chosen as the 2013 January focus of the program. The Mid-South Food Bank serves more than 300 charitable feeding programs in 31 Mid-South counties in West Tennessee, East Arkansas and North Mississippi. For over 20 years, the Mid-South Food Bank has been working tirelessly to ensure that no Memphian will ever go hungry. As the only organization in the region to supply food to all qualified charitable organizations, the Mid-South Food Bank supplies millions of pounds of food to emergency food pantries, soup kitchens, shelters for the homeless, abused women and children, rehabilitation programs, daycares for children, elderly and disabled individuals and after-school programs. 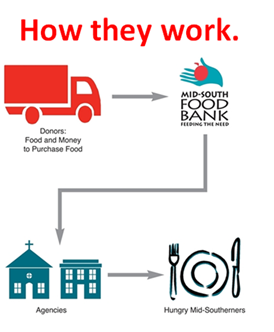 To learn more about how you can help this amazing effort, visit www.midsouthfoodbank.org. The Mid South Food Bank is one of the most worthy charitable organizations in this area and this is commendable that Orion has chosed the Food Bank as the focus for January. We should all be more of the Food Bank’s need all through the year and not just over the holidays.